Learning how to clean an epoxy garage floor coating isn’t hard. In fact, one of the primary reasons for having a floor coating is for the ease of maintenance. There are some basic cleaning tips for epoxy floors that you should be aware of, however, that will help insure a nice clean surface for years to come. These cleaning tips are the same for polyurea, polyurethane, and polyaspartic garage floor coatings as well. As resilient as garage floors coatings are to dirt and stains, they do require some cleaning maintenance to keep their shine. If not, some coatings can start to loose their gloss due to the sanding effect of the loose dirt and grime that gets caught up under shoes and tires. Another issue to be aware of is that some cleaners can leave a film on the surface while others may de-gloss the shine or cause it to fade. So let’s take a look at what cleaners to use and what not to use, as well as some recommended cleaning methods.
. You will find that a dust mop will provide for 90% of your epoxy floor cleaning duties. Since dust and dirt do not stick to the floor, just use the dust mop once a week (or sooner if needed) to keep the floor clean. It only takes a few minutes and you are done. They even work well for floors that have a polymer anti-slip additive in the surface. If you have a floor coating with an aggressive anti-slip aggregate such as aluminum oxide or you don’t care for dust mops for a particular reason, then a soft bristle push broom like this one here make for a great choice as well. For garage floor coatings with contraction joints or saw cuts in the floor, vacuum them out monthly or use a broom to sweep them clean of debris. Spot cleaning for spills or fluid leaks from cars can easily be wiped up with a paper towel, soft cloth, or a clean rag. A shot of Windex works wonders if the spill has left a film. For epoxy garage floor coatings that see a lot of traffic and dirt, it’s a good idea to give your floor a good cleaning once every 3 or 4 months. The best cleaning tools for this is a good quality hard foam mop or microfiber mop. Though some people swear by them, we are not the biggest fan of string mops. They just don’t scrub very well and have a tendency to leave streaks on glossy finishes. A mop we like that works quite well for epoxy floors is this one here by Rubbermaid. It performs great at picking up dirt and debris and leaves very little liquid on garage floor coatings. As with most floor mopping, frequent rinsing in the cleaning solution is the key for the best results. Admittedly, the self-wringing feature of this mop is a great benefit. Another option is a microfiber mop. A clear favorite is this one here from Amazon. It’s commercial quality and has an 18″ width which helps to cover more floor to get the job done faster. What’s nice about this mop is that it also comes with a microfiber dust mop pad. This allows it to work double duty as your everyday dust mop and regular cleaning mop which reduces the amount of cleaning tools you need to store. Our favorite cleaning solution that works well for regular floor cleaning is ½ cup of ammonia to a gallon of hot water in a bucket. 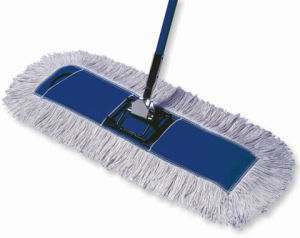 Apply it using the foam or microfiber mop. Be sure to rinse the mop frequently in the bucket of hot water to rid it of the debris it picks up. This even works well for floors that have salt film and residue. You really shouldn’t need anything stronger than this for most jobs. Windex is another solution that will give you a little bit more cleaning power if it’s needed. Mix a ratio of 1 part Windex to 3 parts water. The chemicals in Windex will not leave a film on the coating and do a good job of cutting through residue. For spot cleaning any stubborn dirt that you encounter, a soft scrub pad can be used. Just don’t scrub too hard or you may degloss the surface. If for some reason you have some serious cleaning to do, Simple Green is a product that will work well at cleaning up grease and other grime. This really shouldn’t be needed unless you have a cleaning disaster on your hands or a worn floor of lower quality epoxy that has many scratches allowing dirt to get embedded. Start with a solution of 1 part Simple Green to 8 parts water. A deck brush helps for scrubbing in this case. You can mix it stronger if necessary, however, keep in mind that Simple Green can leave a film on the coating. 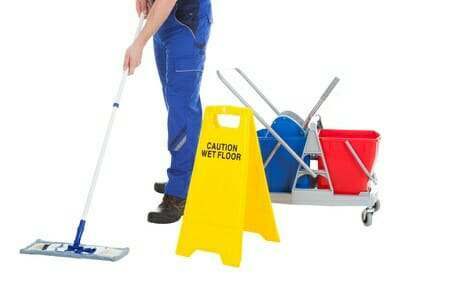 The key is to use a separate bucket of clean water and mop to rinse the floor as you go. When using any of these methods you can just let the floor air dry. You can also wipe it down with a lint free towel if you prefer. Marks left by tires can be the toughest to remove if not cleaned regularly. You can read more about removing tire marks in a separate article here. For rust stains, we recommend using a 1:1 ratio of CLR and warm water. Apply it directly to the rust spot using a scrub brush or soft scrub pad and then rinse with cold clean water. Do not let it sit for more than a minute or two on the surface. When cleaning your garage floor coating, do not use citrus cleaners or vinegar. These types of cleaners contain acids that can slowly degloss the finish of epoxy and other floor coatings over time. Don’t use cleaners with soap in them as well. Soap can leave streak marks and a hazy film on the surface that impedes the shine of the finish. The soapy film can also make the floor much more slippery when it gets wet. Cleaning an epoxy garage floor coating should be easy. Just use these cleaning tips and methods for your quick and easy floor coating maintenance. Doing so will help to maintain a cleaner looking floor that will hold its gloss and finish for a longer period of time. What product can be used over rust oleum rock solid after sanding? Floor is less then a year old and has yellow streaks and spots throughout. These are areas that do not see sunlight. I would like to use a more industrial type coating over the top… any suggestions?? Hi Clint. If the RockSolid is holding down good, we would recommend something like this single-part polyurea here. It is much more durable than RockSolid and it will not yellow (amber) from sunlight. We just painted our floors with epoxy coating a few weeks ago. Did the proper prep and applied 2 coats. Our cat missed the litter box and the residue is an orange colored stain on the epoxy floor that wont come off. Why is this and what do you recommend to remedy this? Hi L.C. What epoxy product did you use exactly? Was a clear top coat applied? If so, what product was it? How do I remove oil stains from an epoxy garage floor please? Hello Dave. Generally oil should not be a problem for an epoxy coating. However, if it has sat for a while on a well worn or poor quality coating then it may be more difficult to remove. Usually the use of a degreaser and stiff nylon brush can do the trick. If that doesn’t work, Goof Off has been known to remove some tougher stains from epoxy. If neither of those work, then the oil most likely has migrated into the upper surface of the coating and cannot be removed without cosmetically damaging it. How do you remove battery acid from epoxy floor. The acid has solidified and recommended products will not loosen or dissolve. Hello Neil. The typical solution for breaking down the reside of battery acid is to mix a paste of water and baking soda. This will help to loosen the residue, but it still may require scrubbing with a stiff nylon brush. Keep in mind that once it is removed, it will have most likely permanently stained the epoxy white. High performance 100% solids epoxy is the most resistant coating to acids, but it is only tested for periods of 24-48 hours. Even these high performance epoxy coatings will permanently turn white if the acid is allowed to sit for an extended length of time. Our snow blower leaked gasoline on our new epoxy floor leaving a yellowish stain. Any ideas on how to remove? Hello Candace. The best method is to use a concrete cleaner degreaser on the stain. Lightly scrub with a nylon bristle brush. Don’t use an aggressive scrub pad or you can degloss the finish. If that doesn’t work, then it’s most likely locked into the epoxy. Epoxy will stand up to gas for a limited amount of time, but if it’s allowed to sit for quite a while it can permanently stain the finish. This is more common for the lesser quality epoxy paint kits and not quite as common for professionally installed coatings. If the shine is fading after cleaning what is a good product to being that shine back? Hello Nico. You may be developing a thin soapy film on the surface depending on what you have been cleaning it with. Try cleaning with a 1/2 cup of ammonia to 1 gallon of hot water to remove any possible film. If that doesn’t bring back the shine, then most likely it’s due to microscopic scratches from wear. At that point there isn’t much you can do short of recoating. I moved into a apartment with neglected floors…the scum on them is thick. What’s the best solution to beautify my floors without causing damage…and can they be waxed?….the kitchen is the worst! Hello Sheila. What type of floors are you referring to? This article is about garage floors. We just purchased a home with an epoxy garage floor. There is heavy duty adhesive tape on the floor. What is the best method to remove the tape without harming the floor? Hi Lynn. Use a blow dryer or heat gun to warm the tape, slowly pulling it up as you go. For sticky glue adhesive and tape residue, Goo Gone works well without damaging the finish. Just let it soak for a few minutes before scrubbing it away. Thank you! We will try it today. I have 2 questions: we have an epoxy floor that was professionally installed. How do we remove rust? You mentioned CLR, but doesn’t that have acid in it? There is one very small spot that has bubbled and cracked. How can we fix that? Hello Rose. Yes, CLR has some mild acids in it. You need that to dissolve rust. When using it on a rust stain, you have to use it sparingly and only on the rust. Try not to wipe much of the area around it. What has bubbled and cracked? Is it the coating?